Amy Madden will be playing bass with the Ricky Byrd Blues Band at Iridium in New York (1650 Broadway at 51st st) on Wednesday June 29th. Ricky Byrd has been playing with people like Ian Hunter, Roger Daltrey and Joan Jett and is now out playing from his new solo album “Lifer”. Bonus info: the club Iridium has been immortalized by Belpid artist Un Rodo Cora in a song by the same name on the album New York-Barentsburg. 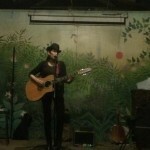 And here’s a photo of Amy from a recent solo gig on Avenue B. 28 June, 2016 in ARTISTS. ← New Latvian Radio album “Until tomorrow gets in the way” out now and entering CMJ Top 200.